Tom Jacques is Reader in Paediatric Neuropathology at University College London. He runs a research group at the UCL Great Ormond Street Institute of Child Health, focussing on brain tumours and epilepsy. At Great Ormond Street Hospital, he provides the only specialist paediatric neuropathology service in the UK. 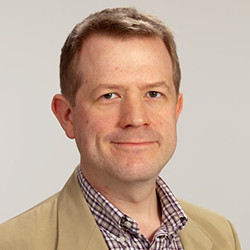 He is Editor in Chief of the journal, Neuropathology and Applied Neurobiology and is the national lead for the Paediatric Tumour Genomics England Clinical Interpretation Partnership. He trained in medicine at Cambridge completing the MB/PhD programme under the supervision of Charles ffrench-Constant. He then undertook junior medical posts in adult medicine and neurology at a number of hospitals in London (including the Hammersmith Hospital and the National Hospital for Neurology and Neurosurgery). He undertook neuropathology training at the National Hospital for Neurology and Neurosurgery and Great Ormond Street Hospital during which time he secured a Clinician Scientist Award to develop his own research programme. Subsequently, he was awarded a nationally competitive HEFCE Clinical Senior Lecturer award. He has received the Cavanagh prize of the British Neuropathological Society and the Sue McCarthy prize of the Medical Research Society.